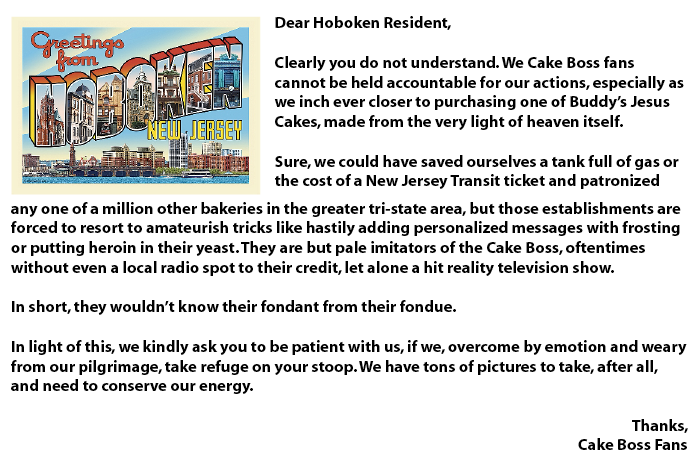 Hoboken, N.J., as if you didn’t already know, is the home of The Cake Boss. All summer, hordes of fans of the reality TV show lined Washington St. on doughy day trips to get a taste of the magical cakes crafted by the gang at Carlo’s Bake Shop, lovingly portrayed on TLC as the Mecca of tri-state area bakeries. So many came this past summer they had to erect barricades across the street next to the CVS and hire crowd control personnel, complete with walkie talkies, to keep fans from furiously rushing the door, absentmindedly getting themselves struck by passing cars or swooning to the pavement in the 95-degree heat. Hoboken even has a “Carlo’s Way” street sign now and lamppost banners prominently promoting the show along Washington, the city’s main drag. Hoboken, I should add, is also the home of your humble author. But far be it from me, or any of my fellow Hobokenites, to scoff, mock, ridicule or otherwise look down upon the out-of-towners flashing pictures and squealing with delight as they approach, praying for a meeting with — or at least a fleeting glimpse of — owner and star baker Buddy Valastro, the Yahweh of yeast. Still, I can’t help but feel for a particular inhabitant of my town who has a right to be at least a tad bit peeved. The folks who live in that building have handled it like champs, from all indications, and every day I pass the sign and smile while I do a stutter step, ducking and dodging photographs. But with the fall air getting chillier every day, the crowds have lessened, and I figure it’s only a matter of time before the sign gets taken down, or simply becomes a fading relic of a year gone by. 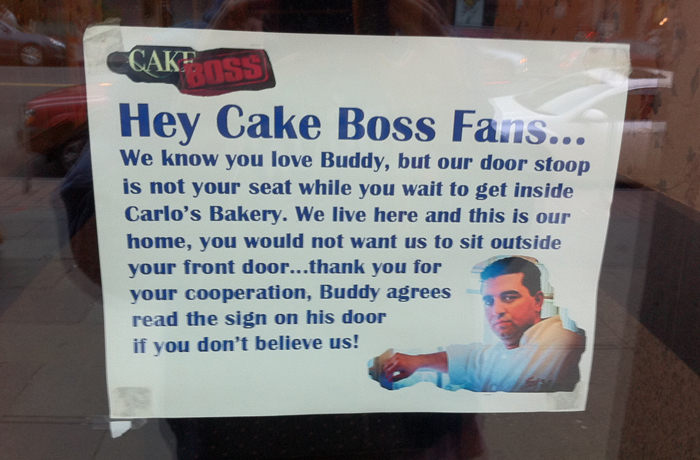 What a shame, I thought, for that to happen without Cake Boss fans first offering a written response. In my infinite wisdom, I decided to make that my job. It took two weeks. On that fateful day, I had worked a night shift and was headed home at roughly 3:30 in the morning. 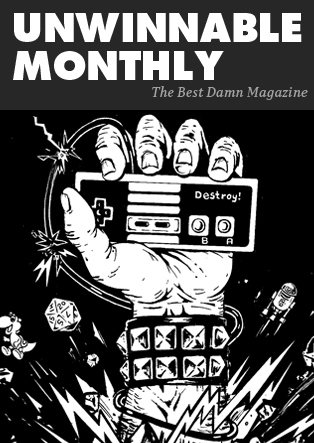 The streets of Hoboken were all but empty, and as I approached the front door of the apartment with my printout and a roll of Scotch tape, only a lone cabbie, parked along the street, was in sight. Trembling a bit with nervousness and chill, I carefully taped the sign to the door, took a flash photo that inconveniently lit up the night and must have certainly startled the cabbie, and walked home. The next day rushed by, and having gotten to bed as late as I had, I didn’t wake up until midday. I made arrangements to meet friends in Manhattan, took a shower, and headed to the PATH train — planning to pass the door on the way. As I walked down Washington, I imagined the possibilities. I hadn’t written my name on the printout, or left any clue of how to contact me, so lest the tenants had convinced the cops to dust for prints or interrogate the cabbie, I had achieved anonymity. More importantly, I had no idea if my note would be taken with the sense of humor I thought it deserved, or be angrily torn down at first sight. I decided to expect the latter, giving it at least an 80% chance of having vanished by morning. I approached Carlo’s Bakery and the first thing I saw was a line of tourists. 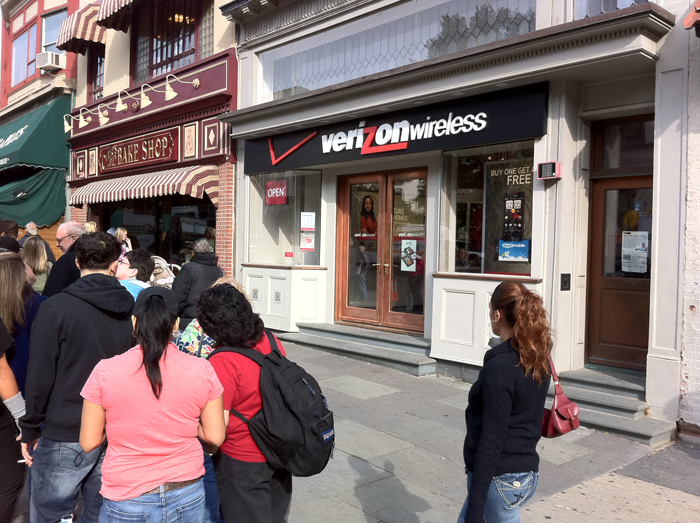 It was a Monday afternoon, so the line was relatively short, but it was enough to stretch past the Verizon Wireless store and reach the door of the apartment building. The same apartment building door that now had two signs on it: One for Cake Boss fans, and, just below it, one from Cake Boss fans, a little worse for wear, but there nonetheless. My sign, to my delight, had been torn from the door and re-taped to it — on the inside. Matt Marrone was disappointed to see that the next time he passed the doorway, his sign had disappeared. Who had originally torn it down and re-taped it? And who had ultimately removed it? He guesses he’ll know as soon as they know who put it there in the first place. You can follow him on Twitter @thebigm.